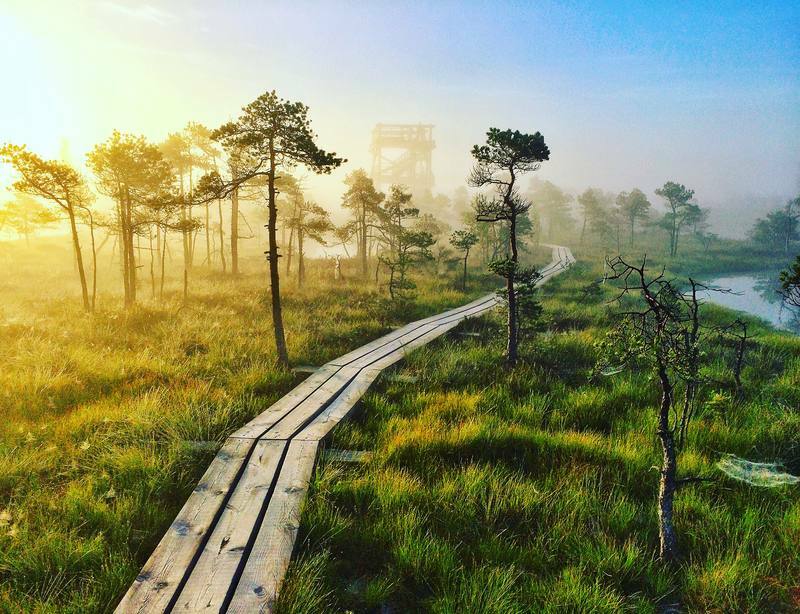 The Great Ķemeri Bog Boardwalk is located in Ķemeri National Park. The national park covers an area of 38,165 hectares. The Great Ķemeri Bog Boardwalk immerses visitors in the world of moss, small pine trees, deep pools, tiny dark lakes and the smell of wild rosemary. An astute visitor will notice the carnivorous sundew plant and a variety of birds – wood sandpipers, white wagtails and tree pipits – and will also be able to hear cranes further away. Those who prefer shorter strolls can take the small boardwalk loop (approx. 1.4 km), while those who choose the great loop (approx. 3.4 km) will be rewarded with the opportunity to climb to a viewing platform that offers a magnificent view of the bog from above. The Great Ķemeri Bog Boardwalk has become a popular place for landscape and wildlife photographers. The whole trail is laid to wooden boardwalk and therefore is fully accessible and can be walked without a professional guide. N.B. Participants are advised to wear comfortable clothing. 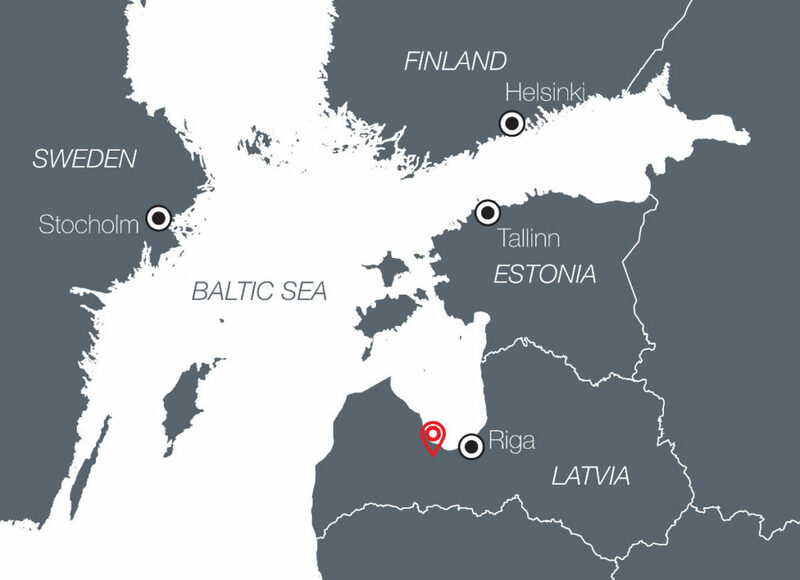 The ride from Riga to Kemeri National park takes approx. 35 min. Arrive at the Great Ķemeri Bog Boardwalk. Meet the bog guide, briefing (approx. 10 min.). 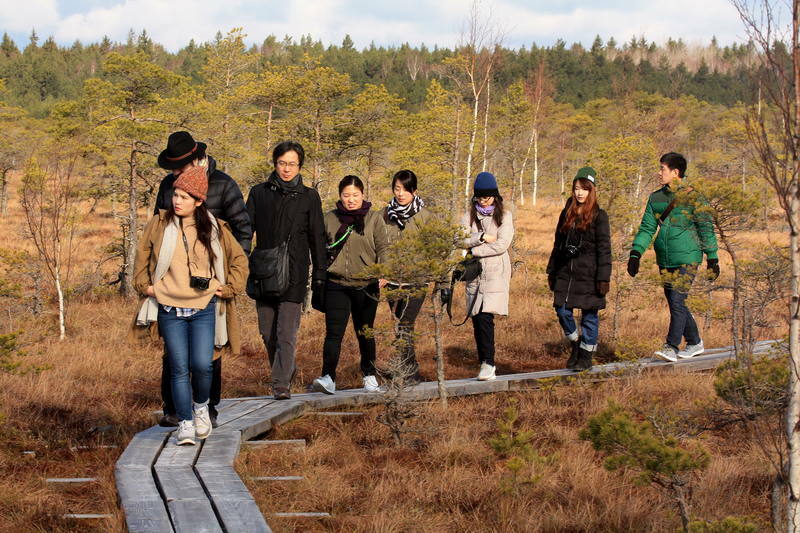 Guided walk on the Great Ķemeri Bog Boardwalk. During the walk the guide will stop at the most attractive views; draw visitors’ attention to the plants, insects, trees and landscapes; and explain what can be seen. Return to the starting point. Bus ride to the Valguma Pasaule Recreation Centre for lunch (approx. 25 km/20 min.). The meal will begin with a small starter picnic in the yard, followed by a two-course meal served in the restaurant’s glass veranda. Duration approx. 1 hour.